Troop 160 Memorial Scout Camp is an organization that was founded in the spirit of Troop 160 and in memory of Craig Goodwin and Adam Beggs, two scouts who passed away while active members of the troop. Since the establishment of the Memorial Scout Camp at Spectacle Pond, Joe Beggs and Wayne Marley have been added in memoriam of their unselfish contributions the organization. Craig Goodwin was a scout in Troop 160 from 1981 until his death. Craig was a scout who came from a single parent home of modest means. Craig gave 100% of himself to all of his endeavors. Craig will always be remembered for his exuberant spirit. Adam Beggs was a scout in Troop 160 from 2000 until his death. Adam was a scout who treated people with respect and was a friend to all. As an older scout in the troop, he had a knack for making the younger scouts feel welcome. Adam will always be remembered for his quirky smile and mischievous dark eyes. As a boy, Joe Beggs was a scout who loved the outdoors. As an adult, Joe became an avid fisherman and hunter. One of his greatest joys in life was spending time at his camp on Spectacle Pond. 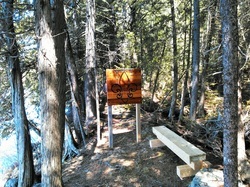 In 2010, Joe Beggs offered to have his camp become the Memorial Scout Camp at Spectacle Pond. As a boy, Wayne Marley was an active scout from North Carolina. As an adult, Wayne served Troop 160, as a leader, for over 30 years. Wayne was instrumental in the establishment of Troop 160 Memorial Scout Camp. Wayne will always be remembered for his willingness to help other people. The Scout Memorial Area is a "quiet area" on the shore of the pond where people can sit, look at the lake, and turn their thoughts inward. The area will feature a large plaque with the following inscription, "Lest we forget those scouts who have gone before us and blazed a trail for us to follow," and will include nameplates for deceased scouts and scouters that we have been asked to memorialize. If you have a scout in your memories that you would like to memorialize at the Memorial Scout Camp at Spectacle Pond, you can request that we do so. We ask that you give us a $10 donation to cover the cost of the nameplate. Use the PayPal button below to make your request.